It’s not very often that I go out of my way to visit museums when I travel, but once in a while I find one that interests me enough to pay a visit. The Edo-Tokyo Museum was one of those that caught my attention. Even though this was my second trip to Tokyo, I still felt like I didn’t know very much about its past and how it has grown into what I think, is one of the world’s best cities. The Edo-Tokyo Museum was the perfect place to learn more about Japan’s capital city, all while having a little fun too! 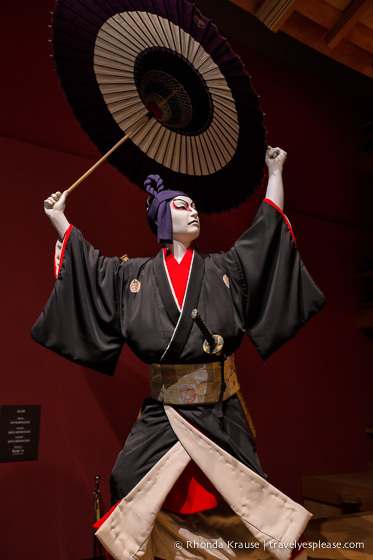 Reconstruction of a Kabuki theatre. The Edo-Tokyo Museum is a large museum in Tokyo’s Ryogoku district that chronicles the city’s transition from Edo to Tokyo, which it was renamed in 1868. The museum has two zones spread across two floors. The first zone showcases life in Edo and the second zone focuses on Tokyo, from its early days to now. My visit started on the second floor, at a replica of the Nihonbashi Bridge. Originally built in 1603, this arched wooden bridge marked the start of the five major highways of the Edo period. From the bridge, I could look down and see a huge replica of a Kabuki theater on the Edo side, and a large reconstruction of a newspaper office on the Tokyo side. Seeing these large-scale replicas made me eager to explore because I could already tell this would be different from other museums I had visited. Crossing the bridge, I entered into the Edo Castle and the District Zones. This was one of my favourite areas of the museum. The model of the chonin (townspeople) areas around Nihonbashi was especially intriguing, with all the tiny figurines going about their daily errands. Next to this was a model of the daimyo’s residence. It was quite clear that the feudal lord lived in spacious luxury, while the townspeople made due with cramped living quarters. Moving down to the second floor, I continued to learn about life of the townspeople during the Edo period. I loved scale-model dioramas that showed everything from a woodworking shop to a temple elementary school. There even was a diorama that explained the custom of childbirth. Moving through the rest of the museum’s Edo zone, I saw exhibits about the city’s commerce, media and aesthetics, along with its entertainment and pleasure districts. Next up I visited the Tokyo zone, which for me wasn’t as interesting as the Edo Zone, but still had a lot of great exhibits and models, some which are even automated. This part of the museum traces Tokyo’s history from the Age of Civilization and Enlightenment, through the Industrial Revolution and onto modern day Tokyo. I thought the most interesting part was seeing pictures of Tokyo after the air raids of World War II and learning about how the city revived itself. As someone who usually gets bored quickly in museums, I was surprised that I actually had an enjoyable experience at the Edo-Tokyo Museum. It wasn’t a typical museum, with just pictures and an information plaque, or small exhibits behind glass that you can’t touch. There were many interactive areas in the museum, with hands-on exhibits, which helps make it fun and engaging for both adults and kids. I loved the large replicas of the bridge and Kabuki theatre, as well as the displays with all the tiny figurines. The museum is very comprehensive in showing the history of Tokyo and is a great place to learn about the city’s past and life of its citizens throughout the ages. Location: The Edo-Tokyo Museum is located in the Ryogoku district of Tokyo, next door to the National Sumo Stadium. Getting There: The Edo-Tokyo Museum is a 1 minute walk from the Ryogoku Station on the Oedo subway line or a 3 minute walk from the west exit of the JR Ryogoku Station on the Sobu line. Hours: The Edo-Tokyo museum is open from 9:30 am- 5:30 pm (7:30 pm on Saturdays). The museum is closed on Mondays. Admission: Entrance fees are ¥600 for adults, ¥480 for students, ¥300 for seniors and free for pre-school and elementary school children. Languages: All the exhibits have information presented in both Japanese and English. Audio guides are available in Japanese, English, Chinese and Korean. For your convenience, here is a list of hotels in Tokyo. Please consider booking your Tokyo accommodations through the included link. It costs nothing extra and helps support this website. Thank you! I’d like to thank the Tokyo Convention and Tourism Bureau for hosting my stay in order to bring you this story. As always, I speak only the truth and hosts have no editorial influence on articles.